When your teeth start to fall out or decay, it may be time to replace them, and you have a few options for their replacements. While titanium dental implants are often recommended, ceramic implants have their own merits and should be considered as well. Ceramic is going to hold up very well over the long term. It won’t deteriorate as quickly as any type of metal would. If you were to use titanium, then the damp environment of your mouth can cause some decay over time. The titanium can also disagree with your other bits of metal in your mouth, such as fillings and braces. Ceramic is resistant to corrosion, as it Is not affected by the saliva in your mouth. It is also considered to be bio compatible, which means it won’t cause an allergic reaction and it won’t interfere with the other metal in your mouth, if you have any. It is also inert, in that it cannot create electrical charges, which can sometimes happen with metal implants. Essentially, ceramic dental implants are one of the safest ways to go with replacement teeth. They reduce your risks for all sorts of complications, and they agree with practically everyone. While titanium may be a better choice for some people, ceramic is safe for anyone to use. Another safety feature of ceramic teeth is that they are made from a single piece of ceramic or zirconia. This reduce the chance that a part of the tooth will fall apart and become loose in the mouth. Metal implants are usually made of two pieces, and excessive masticatory force can break them apart and cause some problems. Many people prefer ceramic implants or the way they appear. They stay clean and white easily, and they tend to look much more appealing with certain types of gum lines. A lot of older people experience gum recession, where the gum pulls back from the teeth. This can make metal implants look unappealing and create a metal residue along the gum lines. Ceramic implants don’t have this problem, and they still look good no matter how the gums behave. How Long Will Ceramic Dental Implants Last? Due to a lack of corrosion and durable construction, ceramic teeth will last for a long time. They can tolerate powerful chewing actions and still retain their strength, even after years of use. Many people prefer how easy they are to maintain, as the rarely need intensive cleaning or repair. They don’t have to think much about them and can generally treat them as normal teeth. After a while, they will start to feel like normal teeth as well, and you may have trouble telling the difference between the natural teeth and the ceramic ones. 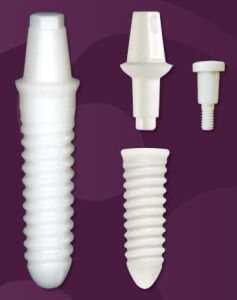 Ceramic dental implants are also an economical option. They are one of the cheaper forms of tooth replacement, yet they are still very durable and hold a lot of value. They will serve you well if you decide that ceramic dental implants are right for you.